Posted on July 14, 2015 . I’m certainly not one of those people/bloggers who wants to try every single night oil or exfoliator available. When my skin loves something I stick to it, sometimes even for years. Recently I ran out of and decided to purchase again two of my skin care favourites so I thought it was time to address them properly and tell you why I love them so much. I’ve been using the Clinique Take The Day Off Cleansing Balm as a second cleanse step (after micellar water) for over a year now. The texture did seem weird at first but I got a hang of it after a few applications. I just take a small amount on one finger, heat it up in my hands and massage it in. The balm turns into oil in seconds and it melts every last trace of makeup including waterproof mascara. After that I use a hot flannel to wipe everything off and splash my face with cold water. The whole process makes my skin feel so soft and clean but never dried out. The balm itself is fragrance free and almost non-greasy in a way so it never irritates my sensitive skin and never breaks me out. I also use it to remove the last bits of eye makeup and it doesn’t sting my eyes in the slightest. My skin is a bit red afterwards because of the light exfoliation done by the wet flannel but it calms down in a minute and leaves my skin super smooth and ready for the next step. When it comes to facial moisturisers I’m very picky. I have a dehydrated combination skin that is also sensitive. A few months ago I did some research on irritating ingredients and decided exactly what I wanted my moisturiser to have and what to lack. 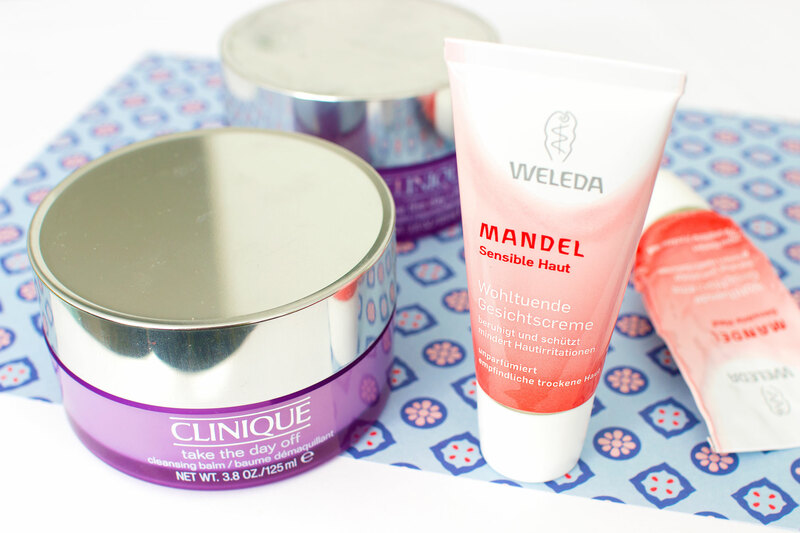 In the end I picked up Weleda Almond Soothing Facial Cream for sensitive dry skin (even though my is not dry). When you’ll look at the ingredient list you’ll see it is VERY short and doesn’t include any fragrance, parabens, mineral oil nor silicones. It’s just a plain almond oil based moisturiser that soothes and really hydrates my skin without making it oily. I use it day and night. At first I was a bit scared to use it in the morning because I thought it would make me look like an oil slick in a few hours but it actually helps my foundation go on smoother and makes it last longer. And when I apply it as the last step of my night routine I wake up in the morning with my skin feeling plump, soft and healthy. Have you tried any of these two staples of mine? I love them to bits and I’m sure you would too if your skin is anything like mine.